In a most condemnable terror attack 40 CRPF jawans were martyred in Pulwama. The dastardly terror attack has sent a wave of condemnation across the world denouncing terrorism in all its forms. The nation is in anguish filling everyone’s heart with intense sense of loss and anger. A fire is burning in everyone’s heart against terrorism and its perpetrators. While nation stands with the bereaved family of the martyrs, there is a resolve that such incidents cannot be allowed to be repeated again. The jawans have laid down their lives in the service of Maa Bharati and the entire nation is feeling indebted to their supreme sacrifice. The sacrifice of the martyrs cannot be allowed to go in vain, India is capable of responding to the threats of terrorism. The time has come to find a lasting solution to the threats of terrorism by meting out exemplary punishment to its perpetrators. It is an established fact that the terror activities in Kashmir are supported and backed by Pakistan. It is very unfortunate to note that Pakistan continues with its designs in Kashmir even after repeated reprimand and condemnation by the international community. It has become a state sponsoring terrorism in other parts of the world and openly backing terror groups giving them all kinds of support. It has become a safe haven of the terror groups like Al-Qaeda, Lashkar-e-Omar, Lashkar-e-Taiba (LeT), Jaish-e-Mohammed (JeM) and Taliban. Not only India but Aghanistan also bears the brunt of terror groups aided and abetted by Pakistan and it has been denounced and condemned by all major powers of the world including USA, UK, France and Russia. But inspite of repeated warnings and condemnations by the international community Pakistan shamefully continues with its active support to the terror groups and becoming a state, sponsoring and exporting terrorism in a most inhuman manner. It seems that Pakistan has not learnt its lessons well even after the surgical strike by Indian security forces in the wake of Uri terror attack. Pakistan is in habit of backstabbing India after having failed in its attempts to fight from the front. It was taught a tough lesson in Kargil and heavy damage was inflicted on it by our brave jawans who crossed over the LoC during surgical strike. As our jawans hands were untied, a large number of terrorists were neutralised and top commanders of various terror groups were eliminated. The terror outfits in the valley were hotly pursued and squarely punished by brave security forces leaving no space for their anti-India and anti-human oprations. It was for the first time that an uncompromising policy was adopted against the terrorist and separatist groups in the valley and the law of the land was strictly enforced. It was perhaps the desperation of terror groups for getting severely punished in the valley that they have resorted to suicide bombings in their attacks. But it seems that they have forgotten that such dastardly acts have always steeled the resolve of our security forces in defending the motherland with greater zeal. 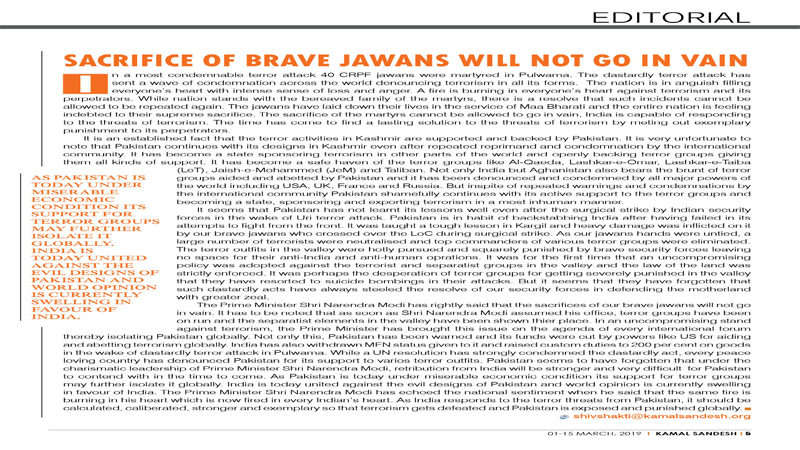 The Prime Minister Shri Narendra Modi has rightly said that the sacrifices of our brave jawans will not go in vain. 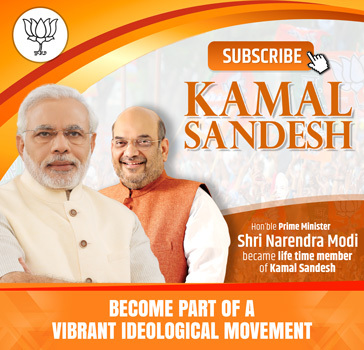 It has to be noted that as soon as Shri Narendra Modi assumed his office, terror groups have been on run and the separatist elements in the valley have been shown thier place. In an uncompromising stand against terrorism, the Prime Minister has brought this issue on the agenda of every international forum thereby isolating Pakistan globally. Not only this, Pakistan has been warned and its funds were cut by powers like US for aiding and abetting terrorism globally. India has also withdrawn MFN status given to it and raised custom duties to 200 per cent on goods in the wake of dastardly terror attack in Pulwama. While a UN resolution has strongly condemned the dastardly act, every peace loving country has denounced Pakistan for its support to varios terror outfits. Pakistan seems to have forgotten that under the charismatic leadership of Prime Minister Shri Narendra Modi, retribution from India will be stronger and very difficult for Pakistan to contend with in the time to come. As Pakistan is today under miserable economic condition its support for terror groups may further isolate it globally. India is today united against the evil designs of Pakistan and world opinion is currently swelling in favour of India. The Prime Minister Shri Narendra Modi has echoed the national sentiment when he said that the same fire is burning in his heart which is now fired in every Indian’s heart. As India responds to the terror threats from Pakistan, it should be calculated, caliberated, stronger and exemplary so that terrorism gets defeated and Pakistan is exposed and punished globally.